Ever since my untimely departure from the Mercury News last month, I’ve been baking almost every week. Which of course makes me chuckle. And which of course makes me think of the movie “Waitress’’ and its hilariously named pies, where right from the get-go you know: It’s personal . Oh, boy, is it ever. But the thought makes me laugh. And gets me to thinking: Just what would actual newspaper layoff cookies be like: Would they be black-and-white butter cookies dipped in both dark and white chocolate ever so messily? Would they be rolled-out sugar cookies cut into the shape of alphabet letters, with a few not-quite-perfect askew ones? Or would they be bittersweet lemon meltaways with a flavor that vanishes like yesterday’s news? I can’t say I had any of that in mind when I tried this recipe from the new The Essential Chocolate Chip Cookbook (Chronicle Books, $16.95) by former pastry chef Elinor Klivans. 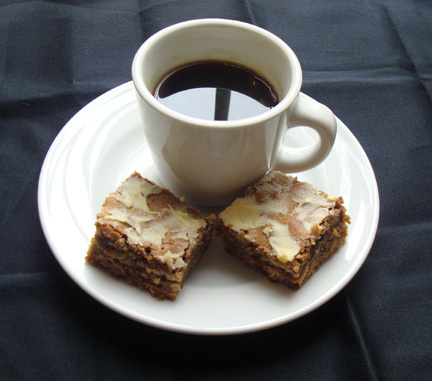 The “coffee and white chocolate chip blondies’’ just appealed to me with their smear of melty white chocolate, reminiscent of just-out-of-the-oven homemade cinnamon buns. Two tablespoons of coffee mixed into the batter lend a lovely café au lait lilt. These soft, chewy, perky cookies are a sure-fire pick-me-up anytime you need a little lift. Position a rack in the middle of the oven. Preheat oven to 350 degrees. Butter a 9-inch square baking pan and line pan with a piece of parchment paper that is long enough to extend over two opposite sides of the pan. Butter the paper. In a small bowl, stir flour, baking powder, and salt together. Set aside. In a large bowl, using an electric mixer on medium speed, beat butter, brown sugar, and granulated sugar until smoothly blended, about 1 minute. Stop mixer and scrape sides of bowl as needed during mixing. Add eggs, dissolved coffee, and vanilla and mix until blended, about 1 minute. The mixture may look slightly curdled. On low speed, add flour mixture, mixing just until it is incorporated. Mix in 1 cup of the white chocolate chips until evenly distributed. Scrape batter into prepared pan. Bake just until top feels firm when lightly touched and a toothpick inserted in center comes out clean, about 30 minutes. Transfer pan to a wire rack. Immediately sprinkle remaining 3 tablespoons white chocolate chips over the top. Let chips sit for 10 minutes, then use the back of a teaspoon to gently smear melted chips to create large marbleized swirls of white chocolate. The swirls will not completely cover the bars. Cool until topping is firm, about 1 hour. These are thin bars and may sink slightly in the center as they cool, because the center is especially moist. Loosen sides of bars from unlined sides of pan and use ends of paper to lift bars from the pan. Use a large sharp knife to cut bars into 16 or 25 pieces and then a wide spatula to help slide the blondies off the paper. The blondies can be covered and stored at room temperature for up to 3 days.